Valencian tile of the 17th, with shades of yellow, dark blue and soft blue, drawing with a central square pyramid. MEASURES: 14 x 14 x 1,7 cm. 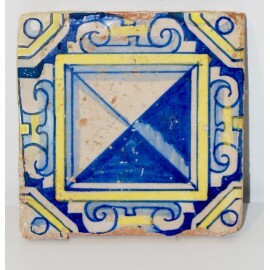 Antiques Valencian tile of the 17th century, with shades of yellow, dark blue and soft blue, drawing with a central square pyramid.